Far from being an ordinary hairstyle, the ponytail has taken a youthful look. Boosted by the stars of the red carpet it is easy to wear, especially in elegant dress or casual style. Revised and corrected it is on all shapes, sometimes strict and tidy in the catwalk, it leads celebrities astray and gives a hint of spicy. Chic, glam, rock or pop, the ponytail is a true chameleon. It became a true icon of hairstyle, the ponytail is a great alternative between letting the hair down and making a bun. Collection hair helps you to find the ponytail that suits you the best. Toni & Guy overturned extra long lengths to prove that even the simplest ponytails can be surprising. The star among all the ponytails, flat on the sides and tied in the neck with a set of contrast divinely made ​​by Saint Algue . Here is a glamorous version of Trevor Sorbie with soft and delicate movements. Redken relaxes codes with this high volume on top that plays hard rock tunes. Opt for the avant-garde look and Jack Holt promises to be exceptional. 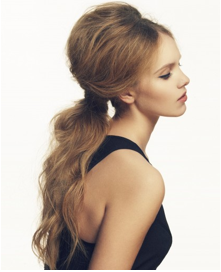 All start with romance and sensuality, this ponytail seduces sweethearts, signed Toni & Guy . Worthy of a fashion show Bumble and Bumble is at the forefront of the trend and unethical. L'Oréal overlooks a high ponytail with a crucial tip: a section of hair acts as a headband surrounding the fixation point. Gentle movements of Vania Laporte are suited for torrid fiestas and sunbathing at the beach. When contemporary takes podiums, Toni & Guy deals with it inevitably. A middle parting, volume ruffled, pink accents, Gaillet Academy surfs on trend with coolness. The famous Alexandre de Paris displays his legendary signature refined and smart that seems to have no equal. 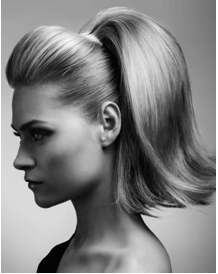 Delicately tied, this ponytail is topped with a slender pompadour, shaped by Coiffeur en France. An exquisite charm with feminine flavor, Raphael Perrier ties with a lock of hair a cascade of smooth curls. Jacques Thill rises high wispy movements that suggest a melody of rock & roll.